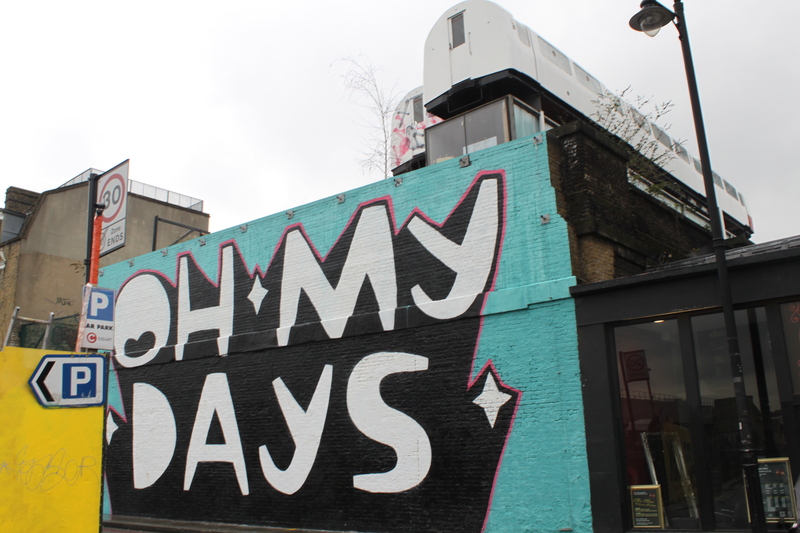 Anna and I took the Alternative London Tour – walking tour of East London. 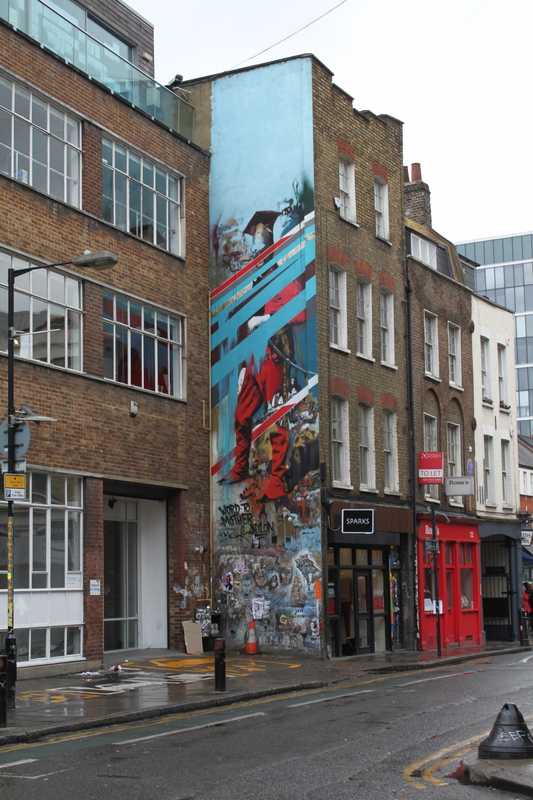 It met near Spitalfields Market and walked the surrounding area to hear the history of the neighborhood and see the street art. 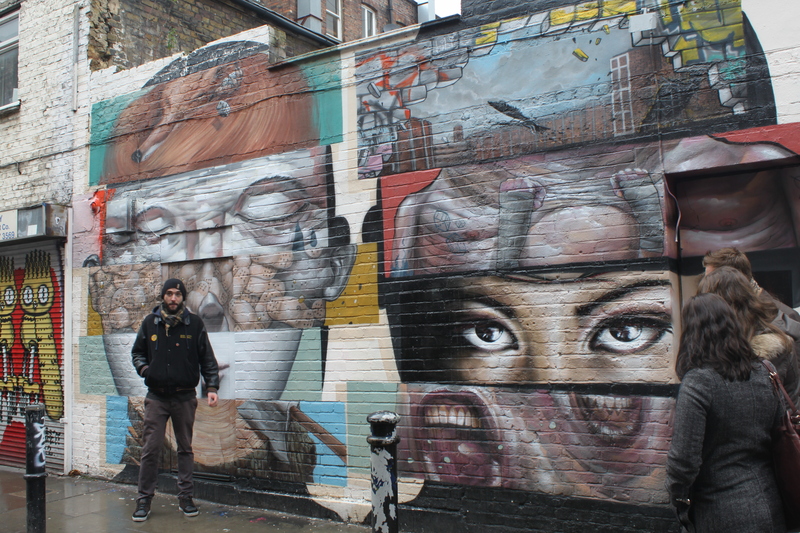 It was the coolest thing I have done in London so far. I loved it. My pictures don’t do it justice at all. The tour guy, Doug, from Scotland, is an artist (more on the video side) but could tell us stories about every artist and piece of work we saw. I tried my best to take some notes to remember the artists names. Anna was late and so Doug had to ask me a few times if she was coming, so he learned my name pretty quickly. 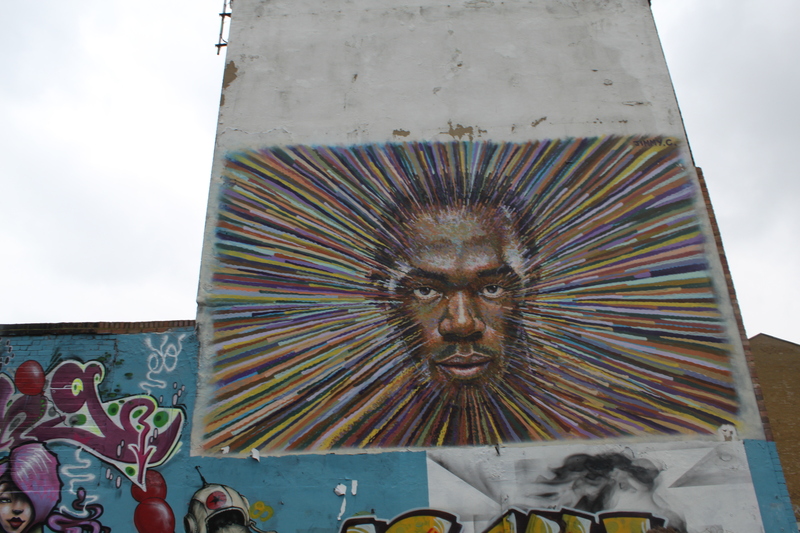 Then as we were walking to our first stop he pointed to a street post that had a sticker on it and said…”Does anyone know what artist did this?” and I shouted out “Obey!” and he stopped, turned around and looked at me and goes….”What?? How did you know that?” I told him, I just know things. And he was impressed! I however don’t think it is that impressive – Shepard Fairey (aka obey) has been around for awhile and made the famous Obama Hope poster during the 2008 election….which was shown at the Smithsonian American Art Museum. I may have been the only American on the tour though, which gives me an edge. 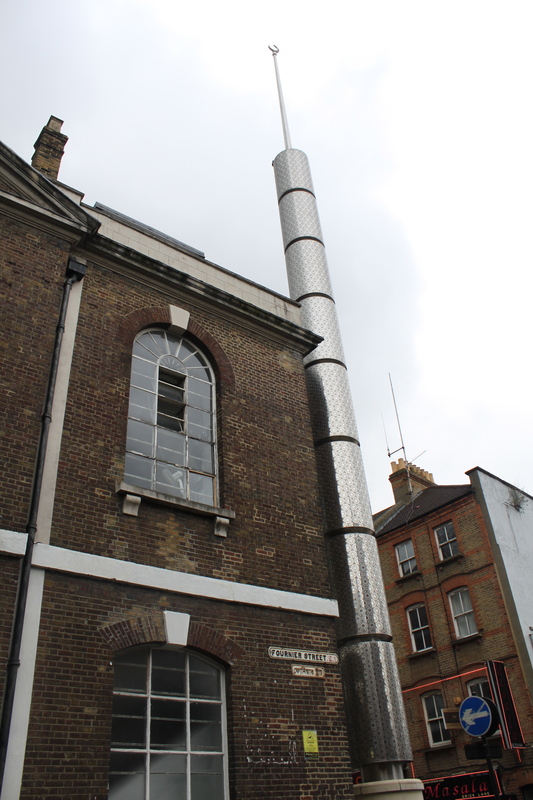 These mini columns (not sure what to call them) are markers that separate East London from the City of London. Doug said they were very important because it shows the boundaries of the city. 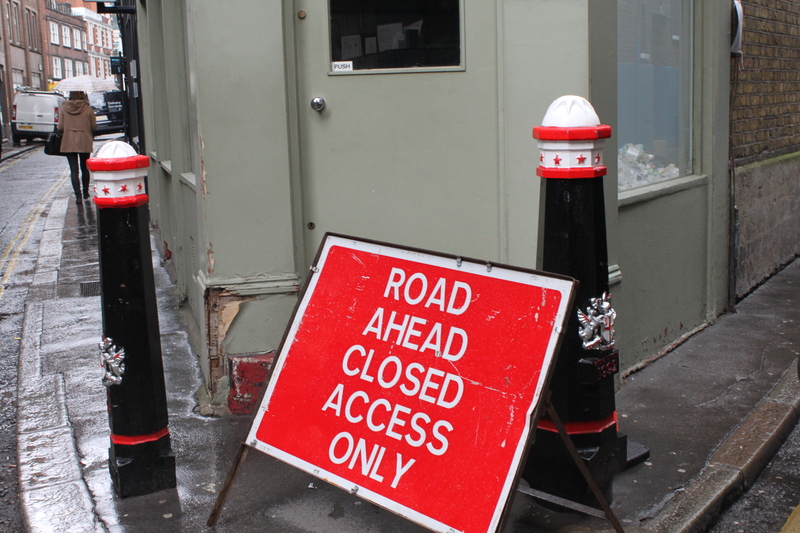 City of London use to have walls around it – now it has these instead. They have these everywhere but the white and red separate them. We also happened to be standing in Diagon Alley when he was showing these to us (Harry Potter fans anyone?) 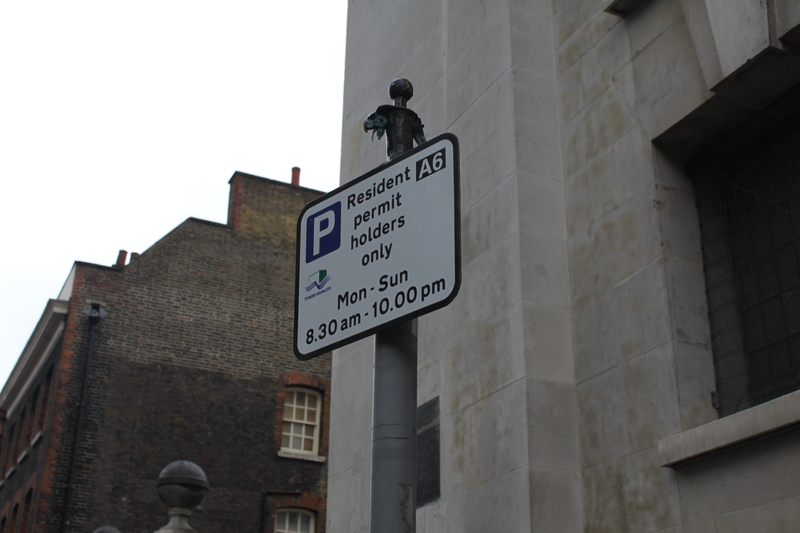 Upon further research this street is also where Jack the Ripper killed his last victim! This is Doug, and this is a piece of art he helped put up. It is a paste up done by Ben Slow (who I will talk about later). 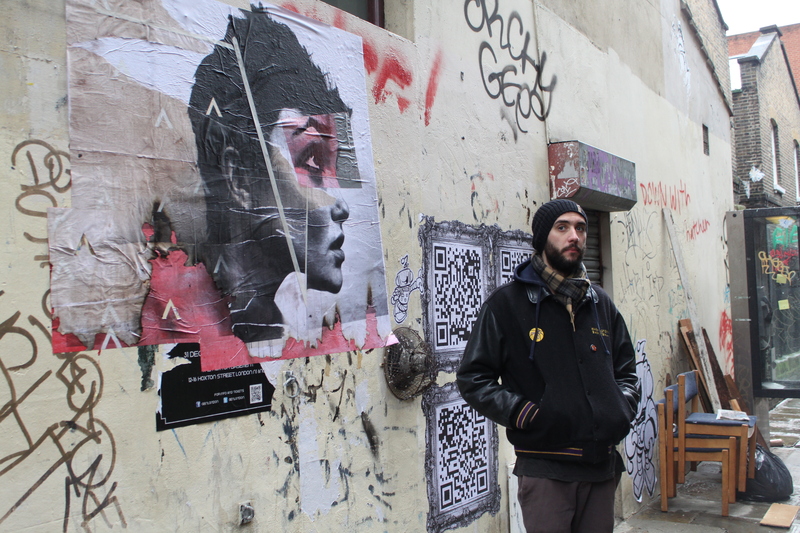 As he explained, he isn’t a visual artist but does document all of this street art through video. He explained the difference between graffiti and street art. 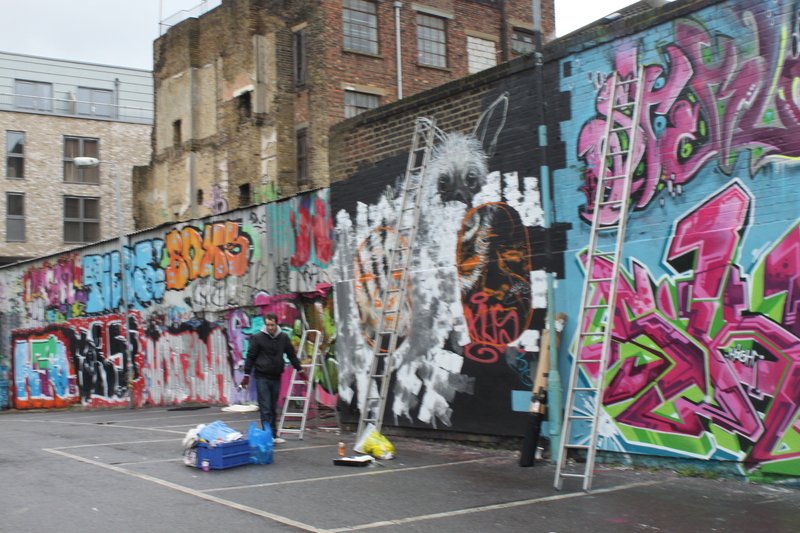 And graffiti and tagging. And commissioned and not commissioned. Legal and not legal. This he said….not legal. It is all done in studio then put up really quickly at the site. 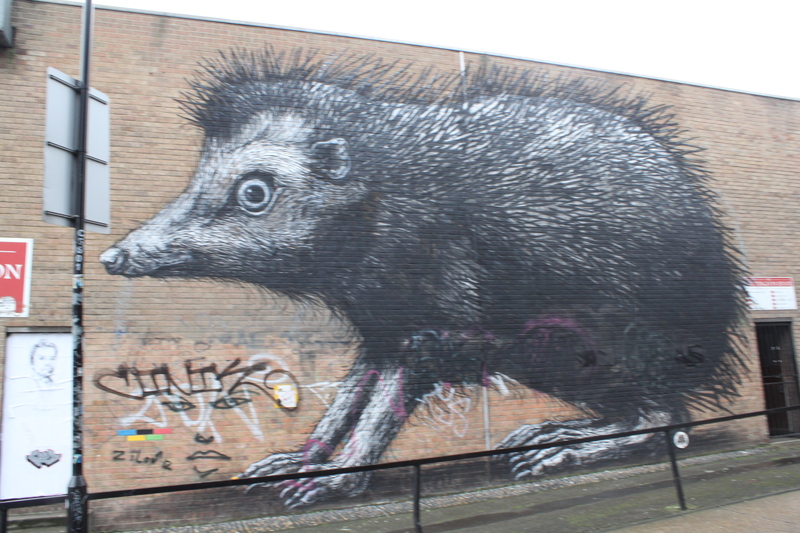 It is street art – graffiti is strictly spray paint only. Tagging is the things you see around, someones name or a word. Street artists don’t like to do anything on top of another street artists work, but once a picture has been tagged it is considered free space again. 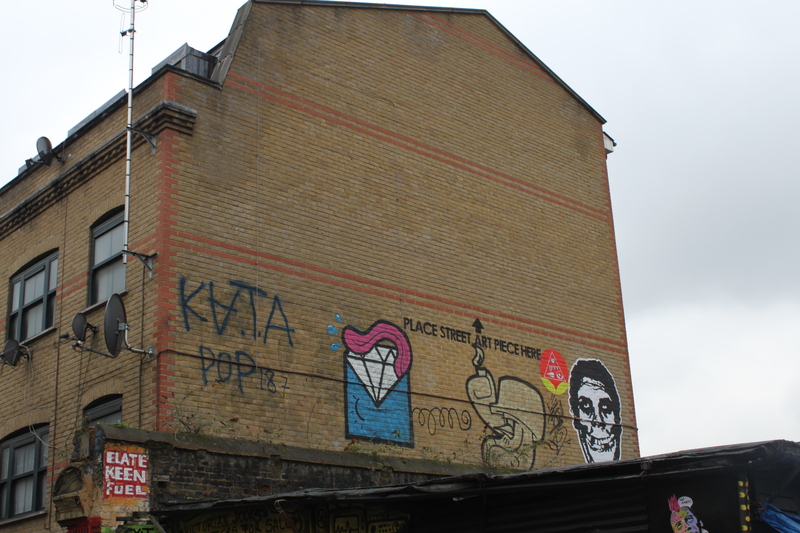 He also said there is pretty much zero Banksy (the worlds most famous street artist) in the area because word gets out that there is a new one up and within an hour it is tagged up. So he doesn’t even bother anymore with the area. See the statue on top of the pole? That is done by an artist named Jonsey. He does them all over the area and it is so cool because you really don’t notice them…until you do. Then you find them everywhere! They are all different and a lot of fun. I found a much bigger one while we were walking and said to Doug, is that a really big Jonesy? And he was so thrilled that I recognized it. I really felt like I was on a trip for class and he was the teacher and I was that student answering all the questions. (and getting them right). This church is super interesting. It started out as a French Protestant church in 1743 for all the French Huguenots that lived in the area. 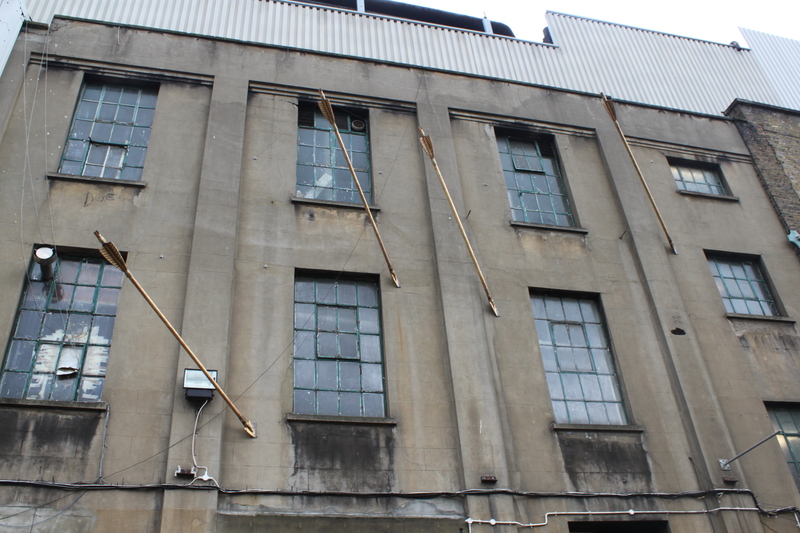 They are the ones that started the area as a textile center. Then there was a huge Jewish immigration from Russia and they took over the textile industry and this became a Catholic church because they were trying to convert the Jewish population. When that didn’t work out, it became a Synagogue in 1898. Then the area got bombed terribly, and Doug said that 25,000 people were killed and another 25,000 became homeless. 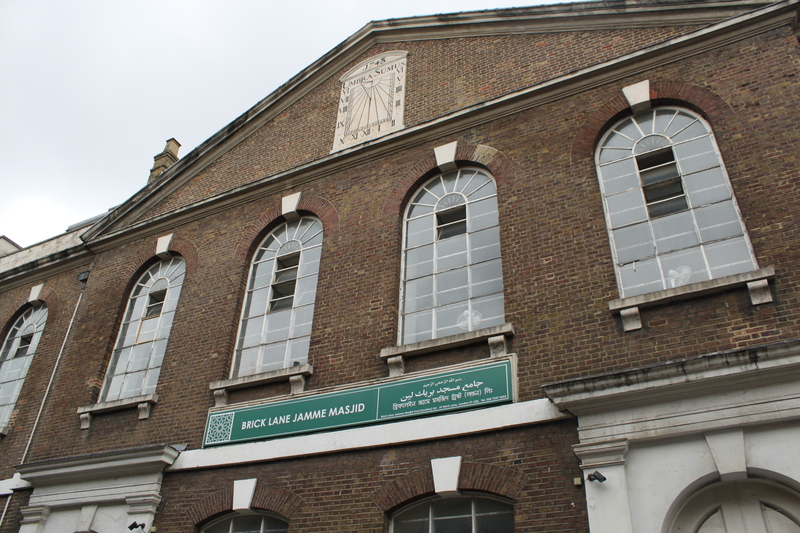 Then there was a huge Bengali immigration and became a Mosque in 1973. 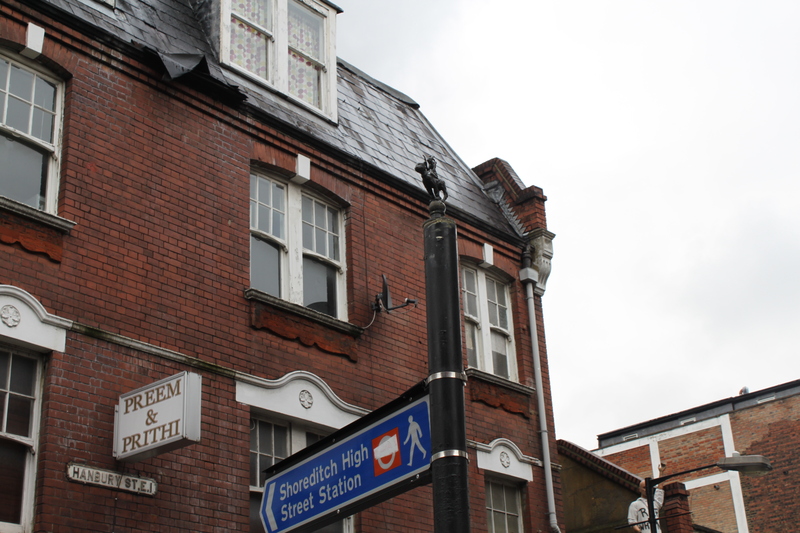 Around the corner on Brick Lane there are 52 curry houses…more than any other street! The area is now known as Benglatown. 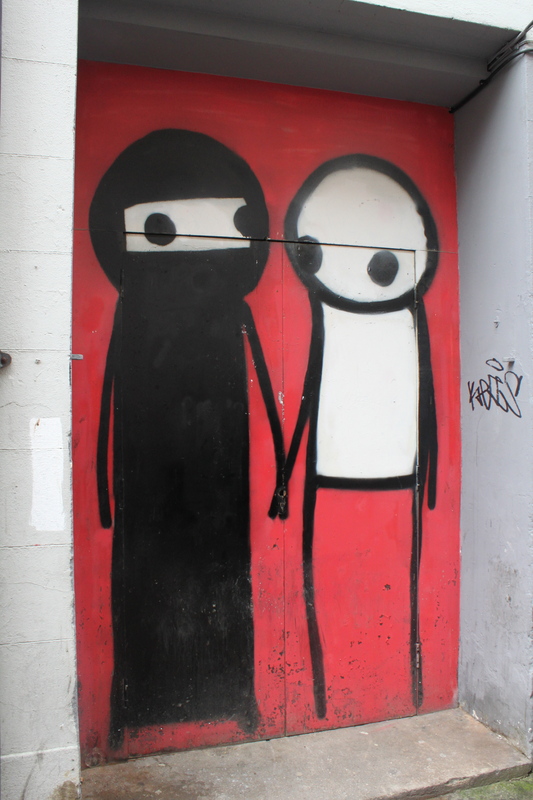 This was done by an artist known as Stik. So named because of the simple matchstick figures he creates. The story behind him is he was homeless two years ago, and would save enough money for cans of spray paint. He started to get noticed and his popularity grew. He now sells for thousands to people like Rhianna, Bono, Elton John, the Duke of Kent and had his own exhibition. His exhibition had 2,000 people lined up outside to see his art, and before the doors open every painting had already sold. He still regularly volunteers at the soup kitchen nearby that he use to get his meals at. 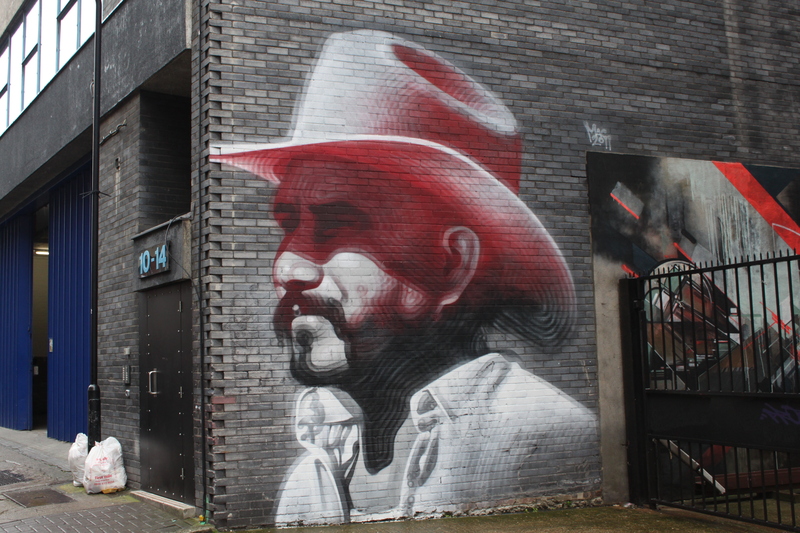 This was done by artist C215. You know it is his work because there is a little cube at the bottom right hand corner of the picture that when you look at it actually spells out C215. 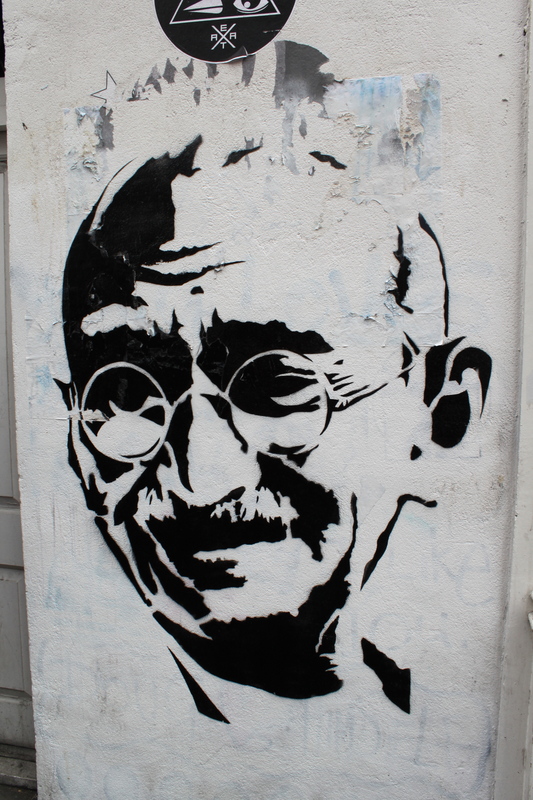 He is from France and does stencil drawings. Doug explained his complicated method but it was beyond me. Apparently this mannequin got put up there and people have been adding to it. 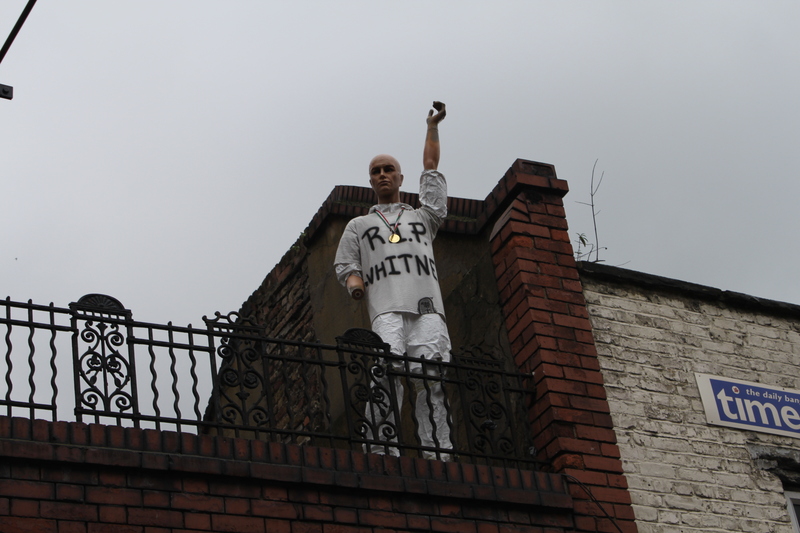 It got a shirt that says RIP Whitney…to which Doug said…where is Whitney? What is that about? And I said…Houston! And Anna looked at me and goes, the city? To which I replied…no the singer. Later on someone added an Olympic medal. You never know what will show up next. 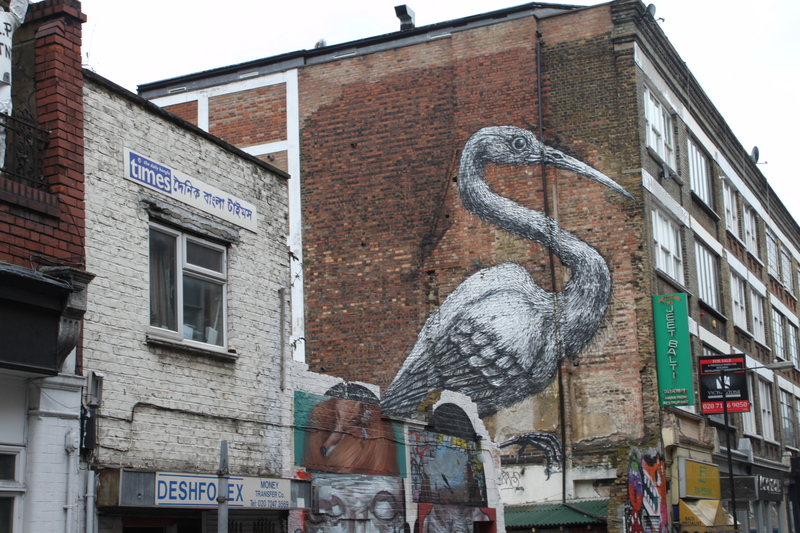 This Crane is by artist Roa. He is from Belgium and does a lot of critters. 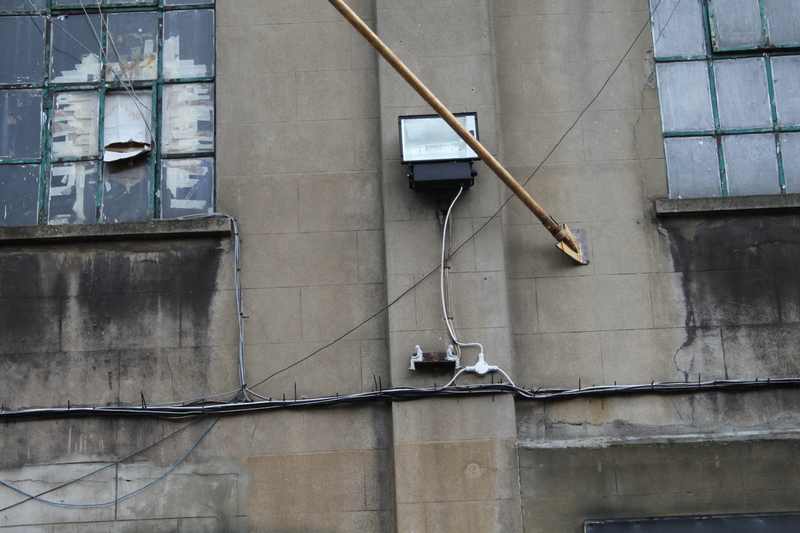 He did this one with a cherry picker. 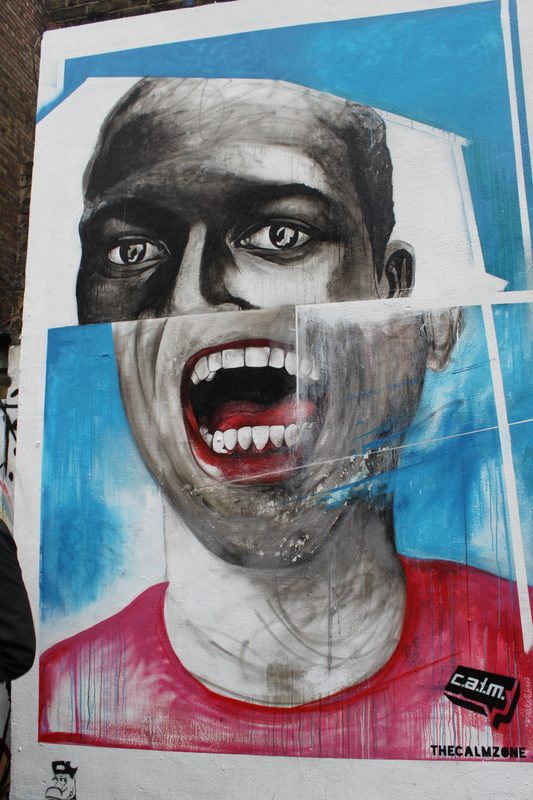 This was done by Ben Slow (who is one of the other tour guides!). He has a fine art degree, and actually does this with paint. He teamed up with c.a.l.m. (campaign against living miserably) for this piece. It is supposed to represent the cool exterior but the inner turmoil. This was done by another French artist. It was all done by spray paint. The side of the wall was done by an artist from Cork. The following pictures are all from one courtyard. So much in the one tiny courtyard! Love these arrows, across the courtyard there is a Bow to match. see the little men on the ledge? They are all around and I didn’t noticed until they were pointed out. 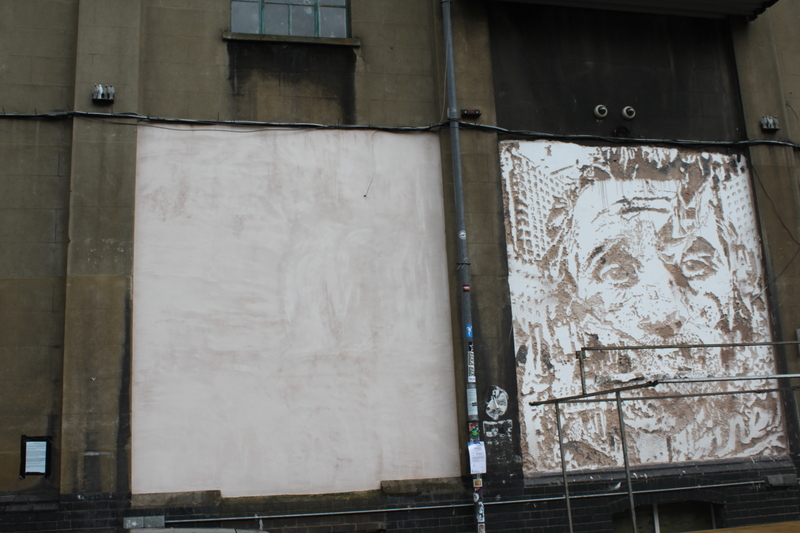 These are both done by an artist named Vhils. He creates these images by putting like…explosives then covering with plaster, and lighting a single fuse and boom…that image comes out. The picture with the blank image on the left, has a single fuse coming out of the top right side. Who knows if that will be something new soon…or if he is leaving it there to show how his work is done, or to trick people. 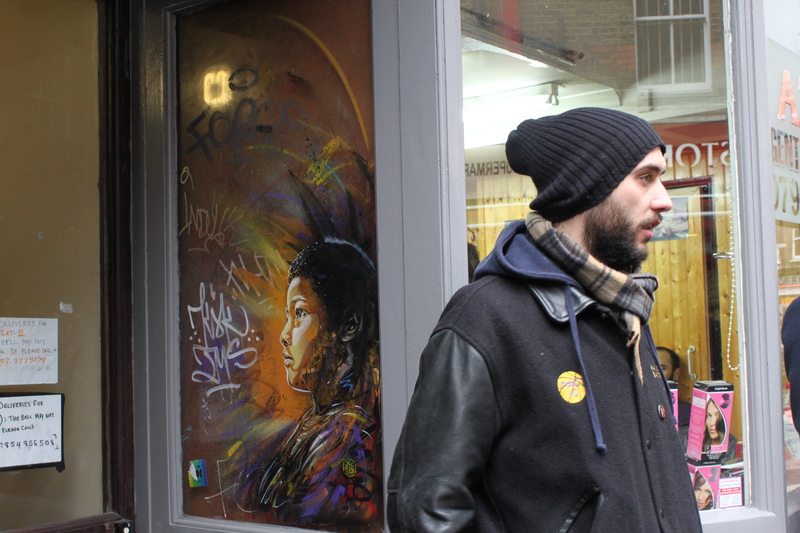 He is 26 years old, and changing the game of street art! 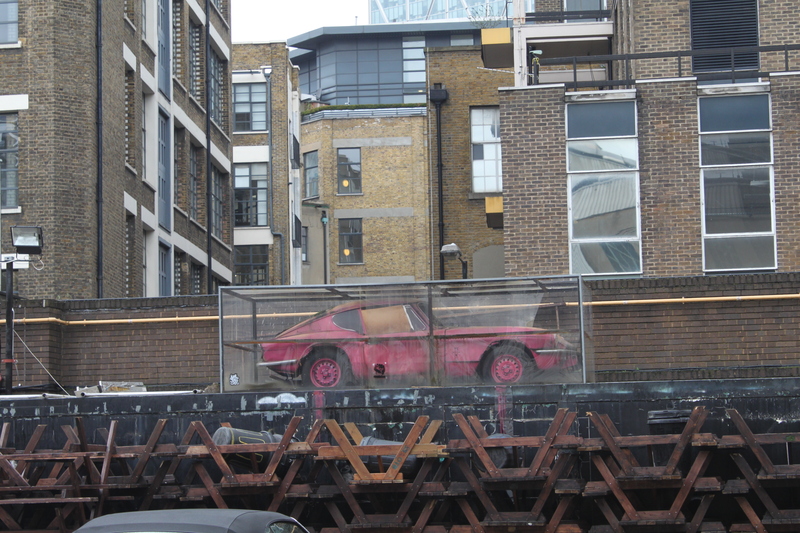 This pink car is by Banksy. He lifted it up there and put a figure int he front seat, to see what people would do. They stole the figure and then put this box around it to preserve it. Doug wasn’t a fan of that, he says once you start preserving the art like that..it takes the meaning away. In response this other artist D Face brought his car, then dropped his figure on top of it to promote the opening of his StolenSpace Gallery. 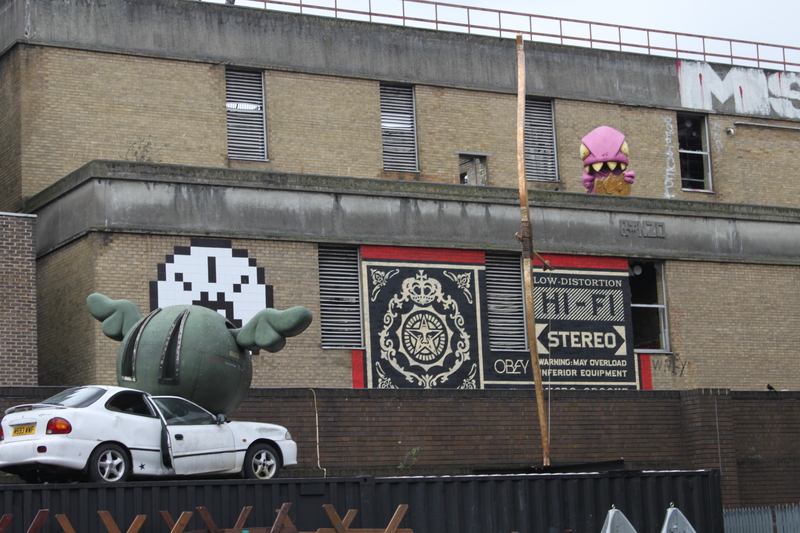 Behind it is a Space Invader. To the right is my Obey, Shepherd Fairey, and in front is that Bow. The pink guy I think he was eating money, I can’t remember. 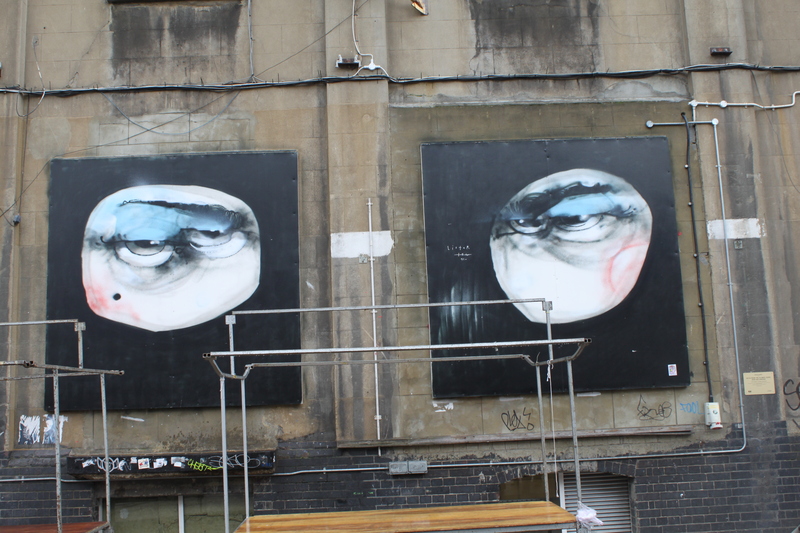 I like this – I am going to go back to see if any street art has been placed there. 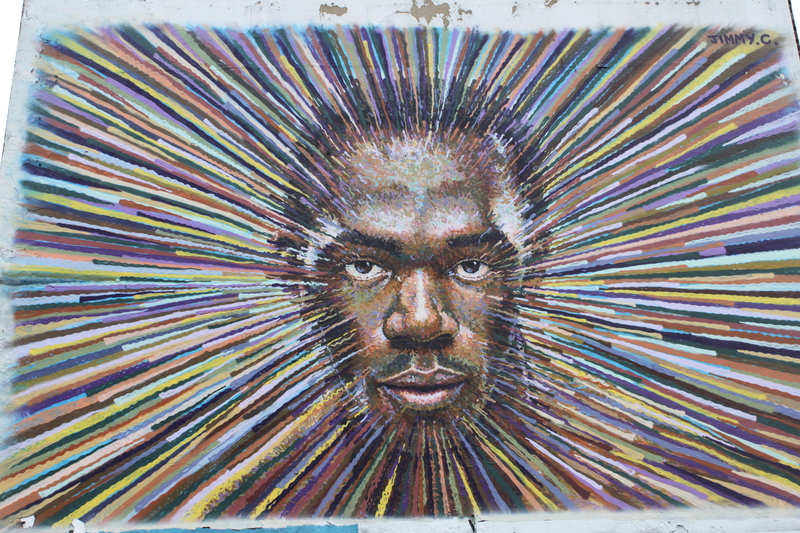 Usain Bolt – done by Australian artist Jimmy C. Huge and awesome. 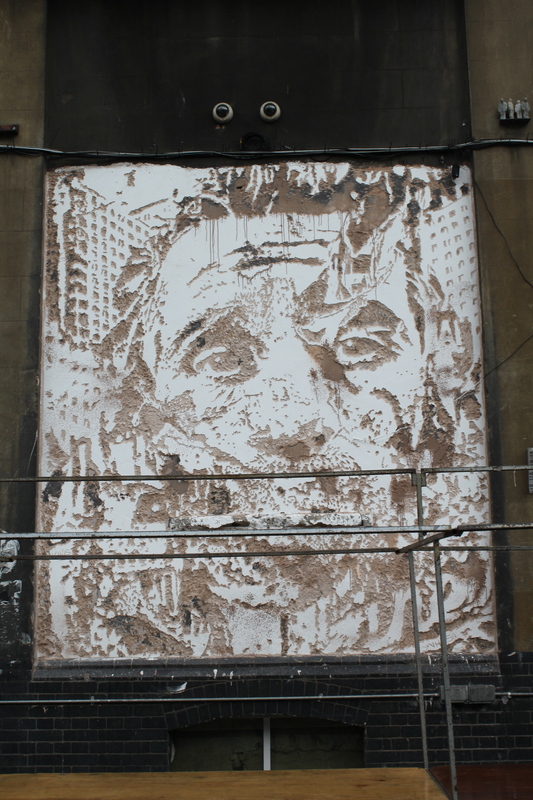 By El Mac and LA artist Another by Vhils. This one done by jack hammer! When you get up close it looks like nothing, it is amazing to think how he created it so perfectly by standing so closely. 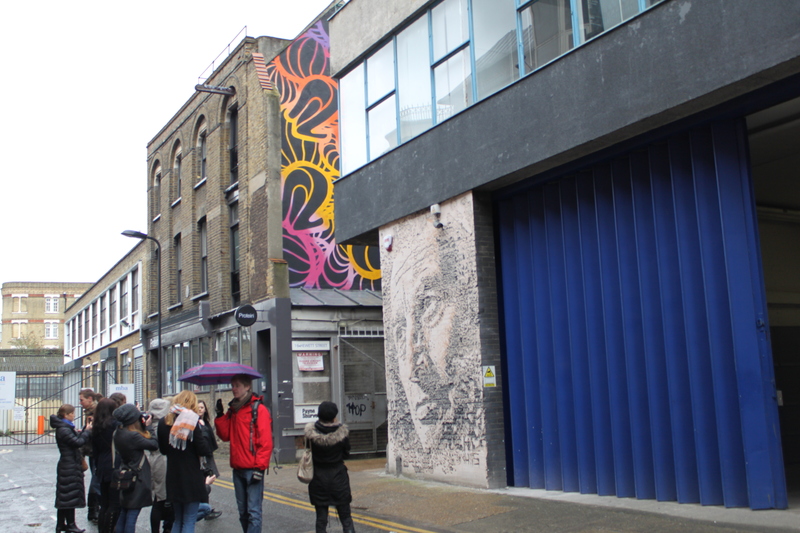 And that is the end of my street art tour! I really recommend it to everyone. Of course we heard the story of how the area is changing, and how our tour guides rent has almost doubled in the four years he has lived there. And how companies came in and built this huge apartment buildings and how he would be surprised if they could even have this type of tour in ten years time. I hope that isn’t entirely true. It is though a common story amongst cities. I remember the H street I saw four years ago, and the H Street I’ve seen today. I hope they can work with the neighborhood to preserve some sense of the neighborhood. Anyway! Afterwards Anna and I went shopping and I bought a dress and skirt, both on sale. So that was exciting! At night Elizabeth and Mia had the Georgetown girls over to their place for a get together to eat King Cake! It was great! Then I went out and met Elizabeth and Anna at Tonteria where they played Spice Girl music. It was fantastic!